Most of us joke about being addicted to things like Snapchat or Instagram, and we’re all&nbsp;probably guilty of compulsively checking our phones for updates. However, social media is changing more&nbsp;than just our immediate behavior. Any interaction your brand has with a potential customer on social media influences both their conscious and unconscious perception of your brand or company — you probably know that already. But perhaps you’re not aware of how those interactions fully play out, and to what extent. For example, there’s plenty of research that suggests social media usage actually triggers the release of dopamine, causing you to experience a rush of positive feelings every time you post, share, Like, comment, and so on. Not to mention, social media interactions can actually increase bonding between individuals, as we tend to view engagement as an act of human acknowledgement. This type of evolution is called neuroplasticity, and the quick, constant evolution of the social media sphere has increased its speed and effects on our collective brains over the past decade or two. Shortened attention spans = the need for bolder, digestible messaging. Due to the onslaught of information coming at us from various platforms and devices, our attention spans are increasingly divided. In fact, a study from Microsoft reported&nbsp;that people tend to lose concentration after just eight seconds. Increased multitasking = the need for&nbsp;multi-channel marketing experiences. Secondly, we’ve quickly become a society of multitaskers. And our ability to multitask and interact in several different ways at the same time has trained our brains to continuously&nbsp;switch gears. The same study from Microsoft identified three natural&nbsp;attention modes that reflect consumer use of digital technology. One of which they referred&nbsp;to as attention ambidextrous mode, in which we “blend tasks together across devices.” We do this because we feel it enhances productivity — whether or not that is true is an entirely different argument. For marketers, this desire to multitask presents another interesting challenge. And as a result, we’re ultimately tasked with creating multi-touch or multi-channel experiences in an effort to stay top-of-mind with consumers. To help you devise a social media strategy that spans across multiple platforms, start by reading this handy guide on how the news feed algorithms work on Facebook, Twitter, and Instagram. The study of neuroeconomics, a combination of economics, psychology, and neuroscience, has become an interesting field for marketers to explore. In other words, the release of this&nbsp;hormone&nbsp;can have a serious impact on the way we interact with friends, family, and brands on social media. And eventually, it can influence our buying decisions. Humans have a “transactive memory.” In other words, we rely on social support — or “external memory aids” — to piece together our own memories. However, social media has taken this concept to the next level, since we can maintain larger digital networks (both in regard to numbers and reach) than we can in real life. Of course, this has taken its toll on our collective memory and attention spans — and whether that is a long-term net positive or negative is a subject for another day. However, marketers should consider this when creating and placing content meant for social media. People generally won’t invest a lot of time into anything a brand creates in the first place, but that might not be due to lack of interest. We’re just becoming quicker decision makers in regard to what is worthy of our attention. Therefore, not only does a given piece of branded content need to have an eye-catching initial hook, it needs to come from a source that the target deems trustworthy and authentic — someone who triggers that transactive memory. Chances are that you are familiar with the term “FOMO” — or fear of missing out on a fun or exciting activity. This concept is hardly new, however, it has significantly evolved as we’ve begun to document much of our day-to-day activities on social media. These days, we don’t have to wait for a friend to tell us they are doing XYZ to trigger feelings of exclusion. In fact, all it takes is a quick scroll through your social media feed to spark this type of anxiety. And this is something that brand marketers can use to their advantage in the social sphere. Nearly everyone follows at least a few brand accounts on social media — whether it be Instagram, Twitter, Facebook, Snapchat, etc. For brands, this means there is an opportunity to tap into this psychological fear to suggest that your audience could be missing out if they don’t buy your product, or attend your webinar, or check out your new website, or … well, you get the point. Generating a little anxiety and jealousy goes a long way towards establishing a connection with your target audience, but be sure to use the tactic wisely. Some research suggests that there are several real consequences of FOMO — such as “increased dissatisfaction with one’s life” and a “decrease in privacy” — so for the sake of others, keep things friendly. At this point, we’ve established that social media can make us anxious or trigger negative emotions … but that doesn’t mean we have to use it for evil. Just like we found a positive way to spin the concept of FOMO, we can do the same for status anxiety. Here’s the thing: Humans have had some level of status anxiety for as long as we’ve formed tribes and gathered into groups. We want to be perceived highly. We want to be desired. We want to be thought of as intelligent, attractive, and humorous. And we want to be seen as a valued member of the group. Essentially, we want to be liked — and we want to be “Liked” on social media, too. But growing your Likes, followers, and engagement is a two way street: you have to Like people back, and make them feel good about their interactions with your brand in a way that goes beyond mere reciprocation. You need to do something that is going to elevate their status amongst their peer group. For marketers, this might mean rewarding the MVPs of your audience with social media shoutouts, or giving them exclusive invites or content that they can share with their followers. The ones who get the direct rewards will get the happy chemical reaction, and everyone else will be just feel a little anxious for being left out — which can do wonders in terms of sparking new participation and engagement. 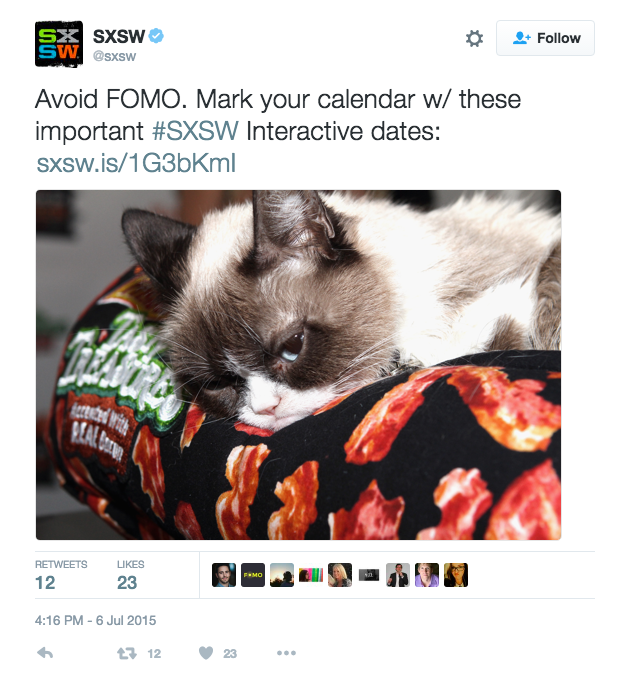 How do you use psychology to inform your social media strategy? Share your favorite tips and concepts in the comments below.